But simply saying “I’ll have my smart phone call your smart phone,” has some key limitations. Relying entirely on these tools naively implies a business environment in which all parties have an equal interest in meeting. Your most important contacts will appreciate a more personal touch, and human input is critical to navigating the art in that the back-and-forth of “scheduling Ping-Pong”. So how do you empower your remote admin in the complex and subtle game of business etiquette that starts when two busy people decide to meet and then need to lock down place and time? Prospective Prialto members will sometimes say they “only” need help with scheduling, as if to imply this is a simple, commodity task. They are right when the playing field is even and the parties looking to meet have plenty of time. Then it really is simply a matter of finding the next open spot on the calendar. The algorithm is indeed simple, and technology alone may get it done. Those experienced in leveraging a professional scheduler will often understand how much time gets consumed in the scheduling ping-pong. They also know that there is an art to navigating through the complexity of how to time reminders and to deciding where and when to meet. So how does one best leverage their assistant to track down targets and get you the right meetings in the right place and at the right time? To do all this, you ought to initially watch every email your assistant sends out and then set times to go over and give feedback on how they can be improved. Doing this for just a few days, will quickly yield great time savings and peace-of-mind. 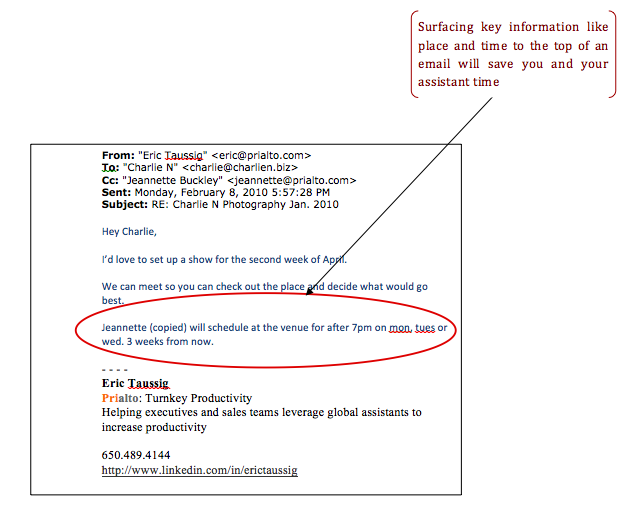 2) Surface key information to the top of long email threads. A good assistant may successfully disentangle long and complex email threads to decipher what you want done on an email, even if you simply copy him in with no instruction. But it may require a lot of unnecessary energy and time. A couple of simple specifics as you CC your assistant will save lots of time and energy. Maintaining positive client relationships with a PA in the middle requires sensitivity. You can’t meet with everyone all the time. You have to prioritize and, while most everyone understands this need, you want to avoid inadvertently insulting even a lower priority contact. 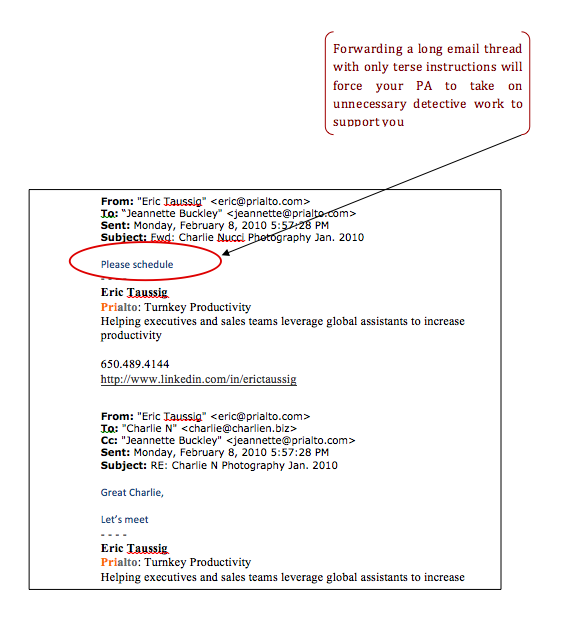 Use special words that you can place in the kind of email copy above to help your PA prioritize on your behalf. See Andy Mowat’s article on how to leverage your assistant to do CRM right. If you are looking to have an assistant help you schedule, you probably are tracking lots of contacts. A CRM and a good CRM process can be amazing tools with which to collaborate with your assistant and track key interactions. But if you’re a relationship person, you probably don’t want to spend too much time meticulously inputting data. Configure your CRM to work with your assistant.